I wanted to like this book, I really tried to like it. I liked A Fault in Our Stars and Looking for Alaska when I read them a few years ago, but after reading Paper Towns I wonder if they were as good as I thought they were. John Green. His writing style is as good as I remember it being. It had so many quirky, cute, and funny moments. As always the book is filled with metaphors and imagery that is entertaining to read. The old shopping center. I think that abandoned malls and buildings are so interesting, I loved seeing one included in a book. The characters in general. Ben was just so creepy, I didn’t like him. He called girls “Honey bunnies,” and then there was that scene early on in the book about how hot he thought Q’s mom was and that whole thing was just weird. I didn’t like Margo at all. To sum her up, she was a brat. Q was alright but I spent the whole book wanting to yell at him for being so obsessed with someone who obviously didn’t care about him. This book just made me feel agitated and annoyed in general. I think it was mainly because of Margo, I could rant about Margo for a paragraph or two but I will not. Yep, the f word is used one or twice. Not really, but there is some discussion. Not really, but there is one scene that is pretty gross and I could have gone without it. John Green, who I’m sure you’ve heard of. 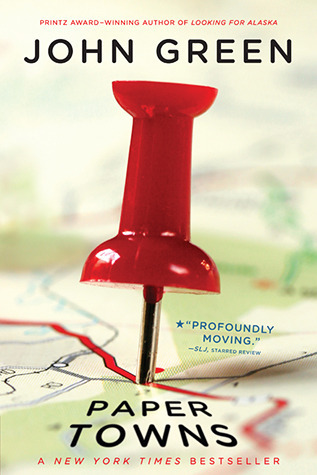 Have you read Paper Towns? What were your thoughts on it? Please tell me I’m not the only one who didn’t like Ben.